Today’s thought is inspired by the men in our lives. Who didn’t grow up wanting to be Batman…or Batgirl!? Who still doesn’t? And why shouldn’t we strive to be someone who stands up for good and defends the weak? Why shouldn’t we take a risk and make a difference in the world? One of the coolest things about Batman is that no one (well, almost no one) knows his real identity. Bruce doesn’t get the recognition he deserves and he’s ok with that. He knows he’s just as flawed as the rest of us and would be called a hypocrite if he pretended to be any better. But when he dons those tights and cape, he is invincible! There’s nothing that can stop him from striving for greatness. So when you think that being “you” isn’t good enough, think about being Batman for a day. Guys, pretend you drive the Batmobile. Ladies, put on those tights and switch the cape for red lipstick. Then get out and plot your next world changing mission! 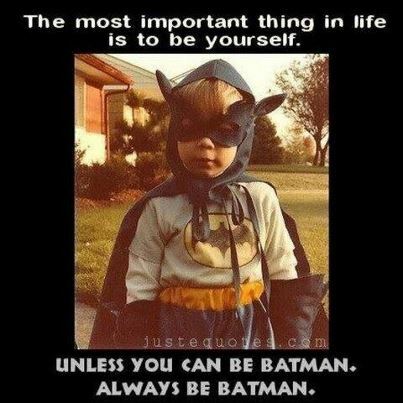 Being you is brilliant; being Batman is way cooler!